The American Academy of Family Physicians (AAFP) Board of Directors selected Cynthia Haq, MD, professor of family medicine and community health, as the recipient of its 2016 Exemplary Teaching Award for Full-Time Faculty. 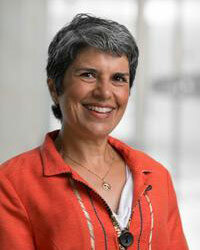 Dr. Haq developed and directs the Training in Urban Medicine and Public Health (TRIUMPH) program at the University of Wisconsin School of Medicine and Public Health. TRIUMPH prepares medical students to become community-engaged physician leaders to promote health equity and provide health care for urban underserved communities through partnerships in Milwaukee. More than 100 students have enrolled in TRIUMPH. All graduates have matched into residencies serving urban, medically underserved communities; 80% have selected primary care careers. Family medicine has been the top specialty choice of TRIUMPH graduates. As the founding director of what is now the University of Wisconsin-Madison Global Health Institute, Dr. Haq has also been an extraordinary advocate for interdisciplinary global health education. Over the course of her career, she helped launch the first family medicine residency programs in Pakistan, Uganda and Ethiopia. Dr. Haq notes that her work has been immensely gratifying and would not have been possible without the enduring support of her family, friends and colleagues at the UW Department of Family Medicine and Community Health (DFMCH). She will receive her award at an upcoming DFMCH event.